Updated April 30th 2013 – many designs are already sold out but the remainders have been marked down! Designer Shoe Warehouse (DSW) has partnered with Disney to release a whimsical Cinderella-inspired shoe line called The Glass Slipper Collection. The collection of six timeless heels capture the beauty, fantasy and elegance of Cinderella – with touches like satin, lace and rhinestone embellishments. You don’t have to be a Disney bride to appreciate these beauties. My absolute favorite part about this collection is that there’s an embossed Cinderella’s Coach and blue Cinderella jewel on the sole! These shoes are available for immediate purchase, however they are limited edition, so don’t wait! You can see all of them from every angle as well as the prices at the link above. I have included some photos for you here, however, that are straight from Disney. 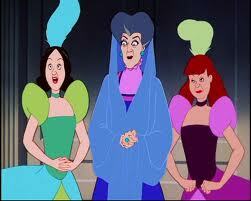 Lady Tremaine, Anastasia, and Drusella will want to get thier hands on some of these for sure!